Printed Sticker is precisely engineered using modern technology with the quality materials to ensure that it is waterproof in nature. We are dealing in Weighing Scale Printed Stickers. Supported by trained personnel, we are readily instrumental in presenting a comprehensive spectrum of Printed Sticker. 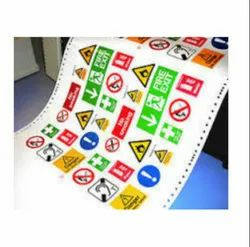 We are providing the first-class series ofPrinted Sticker These are made by professional’s team who has prosperous industry experience and practice. 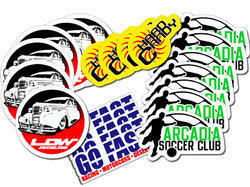 Our exotic range of Stickers made out of paper, PVC and polycarbonate material. All the material is sourced from reckoned vendors of the market, who assure their high quality standards. Our product find their application from miniature to large sized machines. These can be applied to variety of surfaces. - Availability : The labels are made available in portrayed, rolls and sheet forms. Owing to the wide experience in this domain, we are instrumental in offering Printed Sticker to our clients.